Baby boys personalised bib with blue sleeves. Baby boys personalised bib with blue sleeves. Terry bib with Greedy Gator design and embroidered with a name of your choice. PEVA backing for the bib with cotton material sleeves. Baby boys personalised bib with blue sleeves. 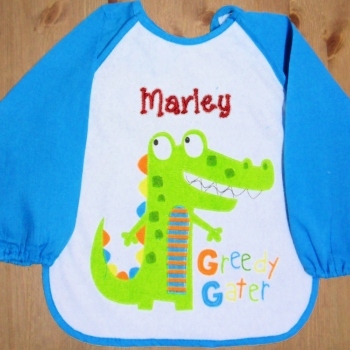 Terry bib with Greedy Gator design and embroidered with a name of your choice. PEVA backing for the bib with cotton material sleeves. Sleeved bibs provide extra protection for clothes and keep baby drier and therefore much happier. Less mess for mum and dad and more comfort for baby. Simply fill in the name you would like embroidered. We will sew the personalisation in a thread colour to coordinate with the bib. Size: 6 mths - 2 yrs.